Because we are so proud of our little gem, one can believe that we are just too overenthusiastic about our own resort or actually even exaggerate its many merits and benefits. Hence our future guests may not be swayed by the sterling endorsements of The Griya by The Griya. That makes sense, we understand that. This is the prime reason why we would like to regularly invite leveraging hotel and travel bloggers who have a large and proven social media following, to come and stay with us. We believe you can provide insight into our property while you visit, as well as some very useful feedback at the end of your site stay. 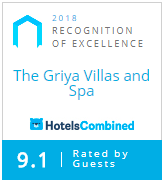 The purpose is to have you illuminate what can be found at The Griya Villas & Spa and to build connections with your devoted fans and audience around the world. We believe that bloggers can help our brand achieve a tone of authenticity that may resonate with our future clients, all the while reaching larger pockets of potential guests. Are you a travel junkie with a penchant for the finer things in life? Someone who has a feel for great taste and can appreciate the upscale luxury we are aiming to provide here? Are you a professional writer and passionate blogger who is willing to give our property an honest and transparent assessment? If so, then please, we would love to hear from you. Reach out to us (marketing@thegriya.com) and convince us why you believe we should choose you as our next visiting blogger. We look very much forward to hearing back from you.